In my posts I have always been talking about the memories of Childhood. The way we used to be then, and the way we are now. The huge difference in lifestyle, eating habits, choices etc. With this Post too, I wanted to revive the old Chutney Roll my Mum used to prepare for our Lunch. It was just like a Desi Pizza, with Chutney spread and loaded with veggies and grated Paneer on top. The only difference was it was rolled for convenience and hygiene issues. Whenever I make Pizza now, I want to experiment with same old Chutneys and try to get the nostalgic taste back. I will share those recipes one by one with you on my Blog very soon, but as of today I am writing how to make a basic Pizza from Scratch. I attended a Pizza making class last year where they taught us basic dough and sauce making, plus a bit of handmade Pasta lessons… it was helpful to the extent that it allowed my fear of making any Pasta or Pizza go away. And I realised that making Pizza from scratch is not that difficult after all. I don’t make it quite often though, but whenever I do I enjoy the Thin Crust Whole Wheat Pizzas a lot. The recipe is taken from Tucci’s Kitchen where I attended the Master Class.. The best Sauce recipe I have come across, after trying several from the Internet. Easy to make and perfect in taste !! Chop the onion into fine pieces. Prepare the carrot by peeling and cutting into 4 equal pieces. Chop the garlic into thin slices. Place the olive oil in a cooking pot large enough to take your sauce and put on maximum heat.Bring the olive oil up to temperature, making sure you do not heat it too much (if smoke builds is too hot). The oil should take on a more liquid consistency when you swill it around the pan. Carefully put the onions and the garlic into the hot oil, being careful not to splash, as the oil will be very hot. Leave on the hot heat for about 2-3 minutes, gently stirring to make sure the onions just sweat and don’t get too brown. Add your herb mix to the onions, stirring gently to make sure it coats the onions and carrots. Add bay leaves. After about 3 minutes put the tinned tomatoes into the mix and stir throughout. Bring the sauce to a boil, and once boiling take the heat right down to the minimum and leave simmering for about 45 minutes. Every now and then, stir the sauce to make sure nothing sticks to the bottom of the pan After the 45 minutes, taste your sauce and season with salt, if it is needed. Onions and minced beef for a tasty bolognaise. The sugo will stay good in the fridge for up to 5 days, and can freeze in containers for up to 12 Months. To make it your own signature recipe, experiment with the addition or omission of garlic, wine and different herbs. Place the flour and salt into a mixing bowl, Dissolve the yeast in the hot water and add the olive oil. Add the wet mixture to the flour and mix with an electric mixer with the dough hook attachment. Or you can can just knead with your hands, although this will take more work. If the dough is too stiff, work with your hands after dipping in warm water. When combined, empty the contents of the bowl onto a floured work surface and knead until the dough is smooth like baby skin. Leave in an oiled bowl covered with cling film and wet towel for at least 3 hours. Once you are ready to use the dough, place on a floured surface and shape to the desired size. This dough will be quite resilient. For thin and crispy, roll thinly with a rolling pin. 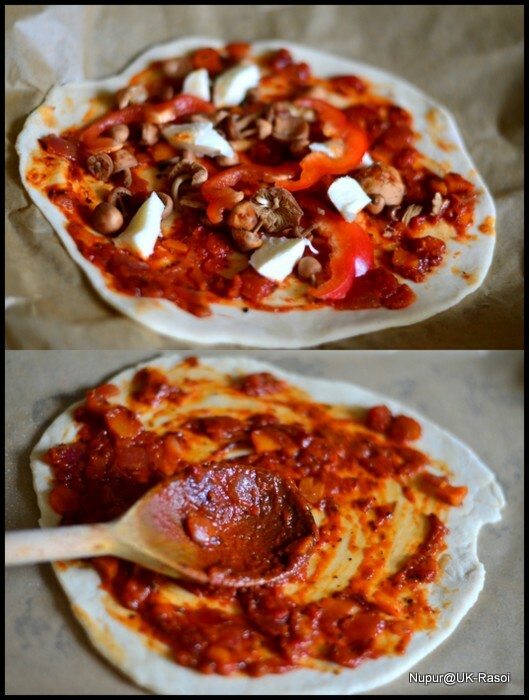 Place shaped Pizza Base onto an oiled baking tray, add Sugo Sauce, Mozzarella Cheese and the toppings of your choice. And place in the oven on the hottest heat for around 8-10 minutes, checking occasionally to ensure it is cooked enough. The pizza is ready when the base is crispy, sprinkle Oregano or Chilli flakes as per your choice and serve hot. Here I have posted the pictures of two Pizzas I pre[pared last month, over different dates. One has the topping of mainly Mushroom,s Mozzarella and Red Bell Pepper and the other one has the topping of Spinach, Sweet Corn, Jalapeños, Spring Onion and bell Pepper. You can mix and match your own toppings. You can substitute half of the APF with the WWF.. It wont alter the taste much, and will be as crispy But if you are doing that, don’t roll the base too thin else it will be too crispy to bite and enjoy. Adding Mozzarella bites is better than grated variety, it spreads evenly and tastes good. Oooo maaa…these pics are making me so hungryyyy Nupur!!! This looks droolworthy! I have to bake one this weekend too. so yummy luking pizza n tempting..
lovely, delectable pizza, I love that you have added carrots to the sauce, beautiful color and pizza is gorgeous. Yummy and delicious pizzas! Nice pics too! wow… that’s a very good pizza… love the way the sauce looks, the color as well and those slices of pizza… feel like grabbing them!!! Wow, wonderful pizza, totally droolworthy. Love the vibrant colour of the sauce and that of the pizza. it looks scrumptious. So glad to have found your site, Nupur:) Love all the servings…And I have to say, your pizza dough recipe is absolutely authentic Italian! A friend of mine who grew up there taught me how to make it ‘her family way’ and it’s just like this…amazing food! That’s a professional looking pizza. Looks like your classes were worth every penny. Thanks for stopping by and commenting on “With A Spin” so that I could discover you. Wow upur, pizza looks inviting and delicious. Amazing pizzas. Adding carrots in the sauce is really new!! Keep it up Nupur.